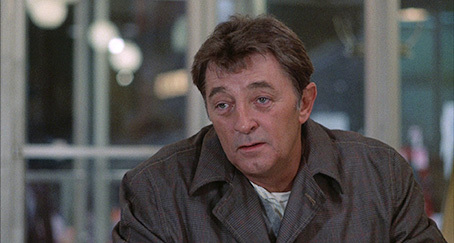 Robert Mitchum is sublime as an ageing criminal whose career is in decline in Peter Yates' superb, dialogue driven 1973 crime drama, THE FRIENDS OF EDDIE COYLE, newly released on UK Blu-ray in a dual format edition by Eureka as part of the Masters of Cinema series. Eddie Coyle is a small-time crook several years past his prime who works as a driver but sidelines as a procurer of weapons for a professional bank robbery crew led by Jimmy Scalise and Artie Van. Hanging over him is a hearing that could result in a prison sentence for his role in a hijacking job that was set up by local bar owner Dillon. A good word from Alcohol, Tobacco and Firearms agent Dave Foley might go some way to keeping Eddie out of jail, but Foley wants to him to become an informer in return. 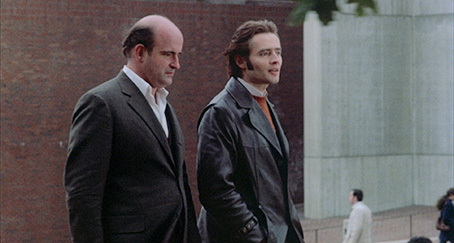 As the threat of captivity looms, Eddie starts providing Foley with information on his contacts, unaware that Dillon is also one of Foley's informers. In the quagmire of opinion on what makes a good movie, there are inevitably a number of opposing theories. Thus the assertion that a film should tell its story visually and never explain through dialogue what can be shown cinematically is up against the notion that talk is cheap, and that a well-written and dialogue-heavy script can provide a low-budget gateway into the film industry for talented first-timers. 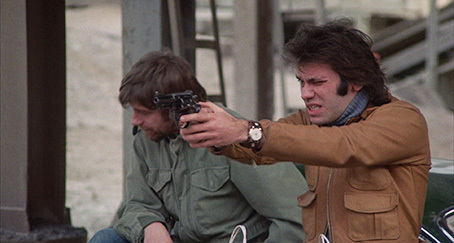 One of many things that distinguished American crime cinema of the late 60s and early 70s was that it struck such a fine balance between the two, smartly scripted works of compelling cinematic economy with well-defined characters, solidly crafted dialogue and grippingly structured storylines. A standout exception to this generalisation is The Friends of Eddie Coyle, a 1973 adaptation of the first published novel by George V. Higgins and a film that is almost exclusively dialogue driven. Action is limited to a couple of low key and almost incident-free bank robberies and a car chase that lasts all of 20 seconds and never gets out of the car park in which it starts, all the more surprising when you consider that the film was directed by Peter Yates, the man behind the genre-defining car chase in Bullitt. Yet it's one of the most compelling and respected American crime films of the decade. Although ostensibly a crime film, The Friends of Eddie Coyle is really more of a character study, and in keeping with that intriguing and ever so slightly ironic title it's as much about Eddie's immediate associates (he appears to have no genuine friends) as it is about Eddie himself. Thus while Eddie is quickly established as the central character, the film spends equal time in the company of Dillon, Dave Foley and (especially) Jackie Brown, and also accompanies Jimmy Scalise and Artie Van on two of their robberies. Each scene expands on what we already know about the characters involved, primarily through how they interact and converse with others. This is particularly true of the long-haired and flowery shirted Jackie – initially he comes across as the new guy with a lot to learn from an old hand like Eddie, but a subsequent meet with his strung-out supplier and the extreme precautions he takes when buying machine guns from a new contact paint a convincing picture of him as a careful professional who has clearly been working in this business for a while and knows just how to watch his own back. Carefully paced and directed with almost invisible precision, The Friends of Eddie Coyle is a sublimely cast film. Eddie is an absolute gift of a role for the seasoned Mitchum, who inhabits the character so completely that despite knowing his face and voice as well as that of my closest friends, I rarely felt as if I was watching an actor playing a part. He's not alone here, with Steven Keats as Jackie Brown, Peter Boyle as Dillon, Richard Jordan as Foley, Joe Santos and Artie and Alex Rocco as Scalise (actors all fans of 70s American cinema should instantly recognise but would likely be pushed to name) all delivering expertly pitched, low-key performances that add to the feeling that we're watching the criminal fraternity of 1970s Boston as it really was. It's certainly a world stripped of crime movie glamour, with every home and diner and outdoor meeting place having a glum and uninviting feel, even in bright sunlight, while the off-season weather wraps everyone in drably toned and almost anonymising clothing. 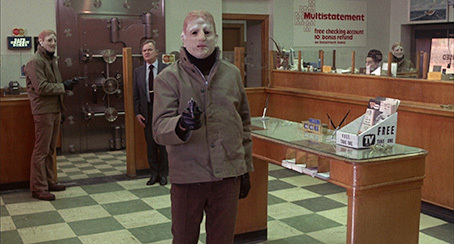 Even the robberies kick against expectations, being exercises in careful planning, coolly observed ritual and enforced cooperation, the absolute antithesis of the smash-and-grab action favoured by filmmakers for scenes such as these. By the halfway mark it has become clear that Eddie is a man who never made the big score he probably once dreamed of, one whose life has been shaped by bad luck and compromise and whose criminal career is now in terminal decline. As desperation takes hold, we feel for the man even as he seems to be unthinkingly sealing his own fate, his fear of incarceration blinding him the possible consequences of his actions and seemingly oblivious to the likelihood that he is being played by Foley. There's a double irony to the manner in which subsequent events unfold that I can't really discuss without hitting serious spoiler territory, and the film once again kicks against the grain by openly signposting a key plot development that other works of the period would have played for surprise. Nostalgia may be playing its part here, but I sorely miss the days when mainstream American crime and political thrillers were smart as a whip and did not have to gallop to get our attention and hold it for 90 minutes. Recently I've been revisiting a number of these films and so far not one of them feels diminished in quality by the passing of time. The Friends of Eddie Coyle is one of the very best works from a still outstanding period for American mainstream cinema, a thoughtfully scripted, boldly paced and beautifully performed object lesson in how to tell a riveting and character-led crime story without ever once having to raise your voice. Any film that makes drabness a deliberate part of its aesthetic is going to present a challenge for any digital transfer, and it's a testament to the 1.85:1 1080p image on the Blu-ray in this dual format set that the picture looks as a good as it does here. The level of detail is consistently strong and the contrast range pitched to ensure that key picture information is not lost to shadow in the more dingily lit scenes. Black levels are crisp when the light levels are bright, though soften just a tad in some of the darker scenes. There is some visible flickering in the dark of night, but not enough to be seriously distracting. The colour palette has a slightly earthy bias that feels right for the film's downbeat tone, but the rare brighter colours (Jackie Brown's car is a prime example) are pleasingly rendered. There are next to no dust spots and a fine level of film grain that does not feel in any way enhanced. Very nice. The 24-bit Linear PCM 2.0 mono track has some minor range restrictions but in other respects is in excellent shape, with clearly rendered dialogue and music and no background hiss or evidence of damage. Optional English SDH subtitles are available. The straightforward title above may suggest a potted history of the director's career, perhaps delivered by a film writer of note, but take a quick look at that running time and you just know you're in for something else entirely. What we have is a recording of an on-stage interview with Yates, conducted by critic Derek Malcolm (whom I genuinely did not recognise, despite having met him twice) at the National Film Theatre in 1996 following a screening of the director's recently completed Run of the Country. Specific films and aspects of their production are inevitably discussed in some detail, including filming the car chase in Bullitt and the problems they had getting Breaking Away off the ground, but he also talks in some detail about the advantages of having the writer on set, his early days as an assistant director, working with big stars, and quite a bit more, all of which I found enthralling. The Friends of Eddie Coyle does get some interesting coverage, and a fair amount of time is given over to audience questions at the end. There are some minor picture and sound issues that we are textually warned to expect from the start, but they do not seriously impact on this valuable inclusion. Sometimes I think I should watch all of the extras before writing my reviews, as here critic Glenn Kenny hits so many of the points that I raised above, often from the same angle and occasionally with almost the very same wording, that I seriously considered a rewrite to avoid any suspicion that I'd simply ripped him off. As someone who knows the novel, he is also able to comment the accuracy of the adaptation, paying tribute to the film on this score when he talks about the "perfect" cast – "not just because the actors are great, but when you read Higgins' book, these guys are those guys." The work of Peter Yates, composer Dave Grusin and screenwriter and producer Paul Monash are also covered. An excellent extra, it does include brief discussion of the final scenes, so is best saved for after that all-important first viewing. Another quality Masters of Cinema booklet, this one kicks of with a fine essay on the film and its lead actor by Mike Sutton, which is followed by a lengthy and most impressively detailed 1973 interview with director Peter Yates on the making of the film, conducted by Andrew C. Bobrow. Also on board are credits from the film, notes on viewing and a smattering of stills. One of the most fondly remembered and thoughtful American crime movies from the 1970s looks as good today as it ever did, and in these days of accelerated action and content recycling, the unhurried pacing, gorgeous performances and low-key handling on display here are downright refreshing. A damned fine transfer is backed by three excellent extra features, making this a must-have for devotees of 70s American cinema. Highly recommended.